For the first time in its 1,100 year long history, the Royal Mint released a series of coins, designed by members of the British public, into nationwide circulation to commemorate the hosting of the 2012 Olympic Games in London. Millions of coins were released into general circulation within the UK by the Royal Mint to commemorate the hosting of the 2012 Olympic Games in London, England from 27 July to 12 August 2012. The 29 designs capture the drama of the biggest sporting event on the planet and each 50p coin showcases one of the 29 Olympic and Paralympic sports contested during London 2012. The coins were issued as part of London 2012's official range of merchandise and will become a long lasting legacy of the London 2012 Olympic and Paralympic Games. Almost 30,000 designs were submitted to the Royal Mint following the launch of a public competition in January 2009. After months of debate and consultation, the final 29 coin designs were chosen anonymously by a panel made up of independent experts, representatives of the Royal Mint, London 2012 and the International Olympic Committee. The winning designs feature images of all the official Olympic & Paralympic sports of London 2012. 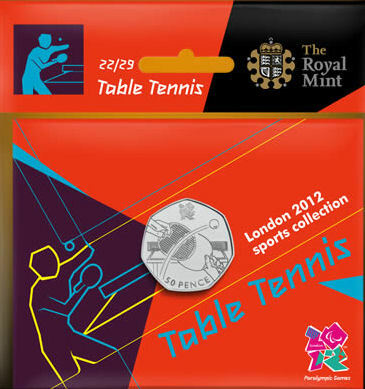 Here's the winning design for the 50p coin which depicts the table tennis events at the 2012 Olympic Games. It was Alan Linsdell, a retired illustrator from Manchester, who designed the table tennis coin, and he has a strong affiliation with the sport. Throughout his life he has played table tennis and his knowledge of the sport is conveyed through his design. 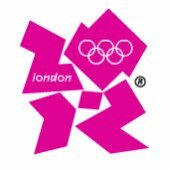 3 million of each coin design were issued, and because they were all official Licensed Products of London 2012, they all featured the London 2012 logo. The coin weighs 8.00g and has a diameter of 27.30mm. Winning designs for the other sports were submitted by people from a diverse range of professions, backgrounds and locations across the country. They included, a policeman from Manchester, a delivery driver from Reading, a radiologist from Stoke, a bank clerk from Preston, a part time chef from Cornwall, an agronomist from Yorkshire and a 75 year old retired social worker from Derby. The collection also makes history by featuring designs from a 10 year old schoolgirl from Bristol and a 16 year old student from Pembrokeshire - the first child and teenager to design a circulating coin of the realm. Since its introduction 41 years ago when decimalisation was established, only 16 designs have featured on the 50p coin, so the 29 new coins represent the biggest concurrent range of designs the Royal Mint has ever featured on a circulating coin. And like every UK coin in use, each design also had to obtain final approval from the Treasury and Her Majesty The Queen. So what did people say about them? "Every one of our twenty nine winners is making history. Their coins will become treasured mementos of the biggest sporting event to happen on UK shores in a generation, and will be around for generations to come. Every coin captures the spirit, excitement and passion of the Olympic and Paralympic Games. In isolation each is a work of art, together they are an inspirational portrait of a sporting phenomenon. The Royal Mint is immensely proud to be part of London 2012 and we're thrilled that this competition has enabled ordinary people to play a part too." "Coins are a part of the fabric of our daily life, so to have a range of coins designed specifically to celebrate London 2012 is a huge honour, made all the more special by the fact that members of the public have designed them. The 50p coins will be part of a long-lasting, wide-reaching cultural legacy that will benefit the entire nation and I'm looking forward to finding the first one in my change and collecting the entire range."